Rod for the alloy, handle and front chuck is engineering plastic, it is very easy to us . It does not to bend over or with hand touch directly to pick up rubbish, it is very clean and hygienic. Suitable for rubbish picking up in the public ,park ,or in the street,a great choice for environment protection,very convenient. 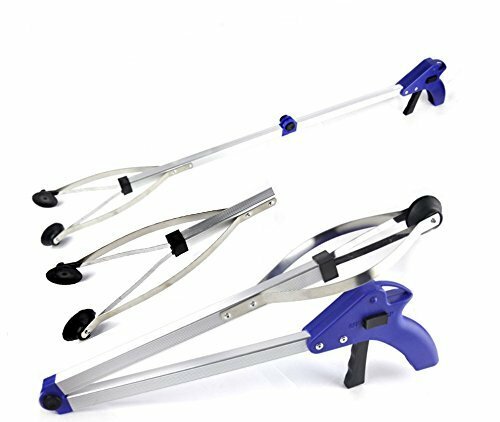 Lightweight and easy to use the itemPlastic handle and jaw with aluminum metal body structure are durable and lightweight. Multi-functionRust-proof for outdoor use,tackles any job from fallen leaves to debris in pond or fountain.or just the concerns from carpal tunnel or arthritis or something out of your reach Padded, anti-slip handle and contoured trigger matches the natural shape of your hand for comfortable, pain-free use. Especially important if using for extended periods of time. Ganranteeif you are not satisfying with the product,just don't hesitate to let us know,we will solve your problem asap. If you have any questions about this product by Xhope, contact us by completing and submitting the form below. If you are looking for a specif part number, please include it with your message.